Tested with Max 2010-2013. No problems. Submitted by shineoooo on Mon, 2019-03-25 09:06. Thanks for sharing! One question, did you get this to work with latest Vray Next? Submitted by Pankuczy on Wed, 2019-02-20 11:10. I've added two additional checks if anyone's interested: one for checking if REGION RENDERING is turned on in VFB, and the other for checking if 'RENDER HIDDEN GEOMETRY' is on in the Render Setup\Common rollout. (With the latter option accidentally turned on it costed me almost whole day to figure out what's wrong with my scene that it renders awfully long). Submitted by alnoman on Wed, 2017-08-30 21:01. Hey, dont you have support up to 2017? or is there any default vray options do the same thing teague do? or how should we get the teague facilities? Submitted by colinsenner on Wed, 2013-01-23 18:24. Martin, thanks for the kind words, hope it serves you well. Glad to help out the community. You work is always an inspiration, keep it up. Submitted by barigazy on Mon, 2013-01-21 16:05. I like this tool and whole idea. Submitted by mb3d on Mon, 2013-01-21 13:47. Hey Man! very good idea is have a selector Objects whit problems, Congratulations! 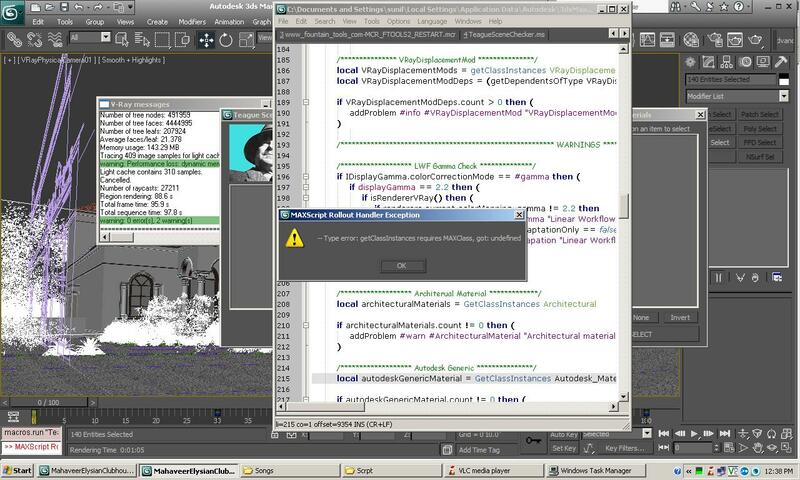 Works on 3dsmax2009!. Submitted by mb3d on Mon, 2013-01-21 13:34. Thanks Collin for share, i will test, and i tell if works for me (3dsmax2009+Vray 2.0). Submitted by colinsenner on Thu, 2013-01-17 10:58. I've fixed the issue for Max 2010 and below users with version 1.02. Please download the newest version. Submitted by fajar on Wed, 2012-12-19 03:13. Submitted by kiran_1979_99 on Wed, 2012-12-19 02:27.
it's great Tool, but iam not able to use.